In 2012, the inaugural Tour de Farm in New Jersey took to the backcountry roads with 100 attendees. This year marks the fourth annual event and participation is expected to reach 1,000. Development pressure and large industry are often associated with New Jersey. But the state’s nickname, the Garden State, is aptly fitting as New Jersey ranks among the Top 10 fruit and vegetable producing states in the nation. The state includes 9,100 farms and nearly 720,000 acres of farmland generating more than $1.1 billion in revenue, according to the state’s department of agriculture. New Jersey’s proximity to New York City and increasing pressure from developers often overshadows its strong agricultural ties. That’s just one reason, Mitchell Morrison, a Sussex County resident, embarked on a journey to bring farms and local residents together. Tour attendees visit the Sussex County sunflower maze. Born and raised in New York City, Morrison was far removed from farming. “There are so many hidden gems with farms here in northwest New Jersey,” he said. “The food we choose to put in our body is one of the most personal things we can do for ourselves and for most people they have no idea where the food they are eating comes from. If we don’t do something dramatic about our food intake, things like diabetes and obesity will continue to increase. If that’s the case, 40 to 50 percent of our GDP will go to health care,” he said. The first initiative brought the farm to consumers. In 2011, Morrison and Ben Del Coro co-founded the Sparta Farmer’s Market. At the local middle school, the weekly market features nearly 40 vendors – a mix of farmers and artisans. Morrison’s second goal was to bring consumers to the farm. Seeing similar events in Vermont and being an avid cyclist who has traveled across the country five times by bike, Morrison knew cycling was an activity he could successfully introduce in northwest New Jersey. Riding from one farm to the next has given Doug McMahon, a Tour de Farm attendee, new insight into the challenges facing New Jersey farmers. “Meeting people from the vantage point of a bike puts you more in touch with them because you are actually more present in their environment than you would be in a car. You get to see up close and personal the conditions these folks operate in,” he said. Tour de Farm attendees celebrate finishing a long ride and pause for photos at the entrance to Race Farm in Blairstown, New Jersey. The day begins with a locally sourced breakfast, often including farm-fresh eggs. Then, avid and recreational cyclists head out on one of three predetermined routes. The rides vary in length from 15 to nearly 70 miles. The number of farm stops included in the tour depends on the ride’s total distance. On the shorter rides, they may stop at four to eight farms. The longest ride includes 10 farms. “We were delighted to have the cyclists stop by for a break on their ride,” said Bradley Burke, owner of Longmeadow Farm in Hope, New Jersey, which participated in the event for the first time in 2015. “The biggest benefit for us is the exposure to many new potential customers who will become familiar with our pick-your-own farm and everything else we have to offer,” he added. Preparing for the visitors was relatively simple. “It didn’t take much of anything for preparation on our part. We set out some samples of our honey and preserves to spread on crackers. The cyclers were thrilled to taste our wares while taking a breather from the ride,” Morrison said. Each farm offers a small tasting of a product or products for riders to sample while visiting the farm. “We offered a dish made with eggs from our farm,” said Hannelie Rheeder of Churutabis Farm in Branchville, New Jersey. Others feature a tasting of an item from a recent harvest, or a small farm-specific item such as flowers, fiber, etc. The tastings are meant to provide visitors with a sampling of the farm’s products to encourage visitors to return after the event is over. The Tour de Farm drives retail business to the participating farms; however, more importantly it gives the general public a glimpse into how working family farms operate and thrive. “In the age of big ag and factory farming, it is easy to become desensitized to where our food comes from and how it is raised or produced,” said Jeanny Cosgrove-Race, of Race Farm in Blairstown, New Jersey. “Some of our customers (from the farmers market) had the privilege to see a live turkey for the first time in their life at our farm,” Rheeder said. Visiting a variety of farms and seeing what it takes to raise or produce their goods can be quite eye-opening and lead to a new appreciation for farming in general. Morrison estimates that the majority of people who participate in events have never been to a farm. “When people visit farms and get to know the farmers, they generally have a greater desire to help make farming sustainable, by choosing local whenever they can,” Cosgrove-Race added. “My favorite quote is ‘if we all eat healthy, our hospitals would be empty,’” Rheeder said. Morrison hopes that by bringing the consumers closer to the farm they may be inspired to buy fresh, local products, leading to a healthier lifestyle. Cyclists are encouraged to bring cash and make purchases while on the ride. Each farm sets up a cooler to store rider purchases. At the end of the event, the coolers are delivered to the final destination where participants can pick up their purchases from the day. Organizers expect 1,000 attendees for this year’s Tour de Farms to visit produce and livestock farms in northwest New Jersey. The diversity of farms that participate in the ride create an opportunity for riders to experience a wide range of agricultural enterprises from produce to meat, honey, flowers, fiber and more. No two farms are alike. Even when they may sell similar items, each has a unique story to tell in regards to how the farm was started and the generations old or modern philosophies they have chosen to guide their business. For example, at Race Farm, visitors can learn farming is a way of life for the 70-year-old, multigeneration farm that specializes in fresh, local produce, while helping to keep open ground and sustaining agriculture in New Jersey. Another stop along the ride includes Churutabis Farm, a poultry and fowl farm. There they raise chickens, broilers, ducks, rabbits, guinea fowl and turkeys. Visitors can see firsthand how some farms follow a philosophy whereby they do not apply pesticides on the fields or feed the animals any antibiotics or growth hormones and instead use natural ingredients on the farm and local feed, food and products when possible. Here, cyclists also can learn about agriculture in other parts of the world. As a child, Rheeder immigrated to the United States from a family farm in Namibia, a country on the west coast of Africa. Though the farm is uninhabited, she has strong emotional ties to the farm and extended family use it as pasture land for more than 500 Boer goats. At another stop, Bear’s Den Alpaca Farm maintains a herd of the camelidaes, which is protected by livestock guardian dogs. Visitors can learn about the farm’s breeding program and how the animal’s coat is harvested and sold for a variety of products. 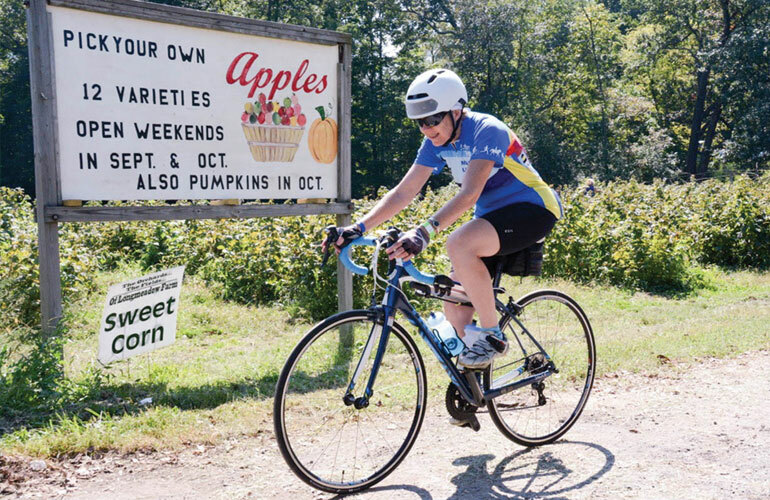 With nearly 20 participating farms between the ride in Sussex County and the other in Warren County, there is something for everyone. “Before getting involved with the farmers market and this ride, I didn’t know much about farming. I’m fascinated by it, and hopefully through these efforts, others will be, too,” Morrison said. After the day’s ride, cyclists and non-cyclists can purchase a ticket to A Farm to Fork (F2F) feast. Morrison anticipates between 75 and 125 guests will purchase tickets for $125 each to attend the post-ride dinner. About 75 percent of the feast attendees are bicyclists who participated in the tour. Farms on the tour include those that grow fruits and veggies, but also those that raise livestock. The menu for both locations features appetizers, salads, entrees and desserts made with locally sourced, farm-fresh ingredients. In Sussex, dinner guests can choose from a broad range of offerings that includes pork-ale-cheddar sausage with toasted panelle, tri-colored potato salad, Asian-style game birds, fresh walleye pike and apple pie. At the Warren ride, the feast includes a cocktail hour with complimentary local wines. The menu includes a range of options from beef tenderloin crostini to sesame ginger scallops, Chicken Provençal made from free-range chicken and homemade vanilla and salted caramel ice cream.